Spinach is a nutrient dense vegetable and is quite a wholesome one. During pregnancy, the body of the pregnant women needs plenty of nutrients for the growth as well as the development of the unborn baby. The mother-to-be also needs a lot of energy and so the intake of a balanced diet is a must. Spinach is also a superfood and it overflows with many nutrients, vitamins, minerals, iron etc. which are good both for the mother and the baby. Let us get an insight regarding spinach, its nutritional value, how safe it is, the importance of spinach in the first trimester, consumption of spinach juice, recommended dosage, health benefits, side effects etc. Spinach is an edible flowering plant, the leaves of which are consumed as leafy vegetable widely in India. It comes in fresh, frozen, canned, chipped, or dehydrated forms. It is a superfood enriched with ample nutrients. This dark leafy vegetable is extremely beneficial for the hair, skin as well as the bones. It even offers iron, protein, vitamins, and minerals. What Is The Nutritional Value Of Spinach? Fundamentally, spinach consists of 91.4% water, 3.6% carbs, and 2.9% protein. Spinach is loaded with iron, antioxidants, and insoluble fiber. Spinach is an exceptionally nutrient-rich vegetable. It contains high amounts of carotenoids, vitamin C, vitamin K, folic acid, iron, and calcium. It is also loaded with vitamin A, B1, B2, B3, sodium, phosphorus, potassium and magnesium. Is It Safe To Consume Spinach During Pregnancy? Consumption of spinach offers a nourishing uplift to the diet regime followed during pregnancy. And, it is completely safe during pregnancy, if taken in moderation. Why Is Spinach A Must-Eat Food During The First Trimester? Spinach is enriched with folic acid and helps in the prevention of neural tube deformities especially in the first trimester. It helps the neural tube to blend properly in the first few months of conception. Is Spinach Juice Safe During Pregnancy? Having spinach juice is a very healthy option for the pregnant women. The fresh spinach juice has vitamin A, C, K, B6, B2, folate, magnesium etc. that helps to keep the baby healthy throughout the pregnancy. How Much Spinach Is Recommended To Have During Pregnancy? The dosage of spinach is dependent on many factors like the age of the person using it, health conditions, etc. However, one small bowl of spinach is perfectly safe to have during pregnancy. What Are The Benefits Of Eating Spinach During Pregnancy? Rich In Vitamin E: Spinach is enriched with Vitamin E that helps in the prevention of asthma. Vitamin E also enhances the vision and also regulates cholesterol levels in the body. Enhances Bone And Teeth Development: Enriched with calcium, it helps in the strong development of teeth and bones. Enhances Fetus Lung Development: Spinach is an excellent source of beta-carotene, which eventually converted into Vitamin A. Vitamin A plays an important role in the fetus lung development. It is an important factor for your unborn baby to gain adequate weigh as well. Bring Down The Risk Of Premature Birth: Chances of miscarriage increases if one does not take an adequate amount of folic acid. Consumption of spinach helps in the prevention of pre-term labor. Alleviates Constipation: Constipation is a common, yet annoying issue during pregnancy. It can eventually increase the chances of contracting hemorrhoids during pregnancy. You can combat both these issues by including spinach in your pregnancy diet. This is because spinach is rich in insoluble fibers. Rich In Vitamin B: Spinach is rich in vitamin B. It is beneficial for both mother and child. For mother, this will help to combat the mood swings and anxiety and stress during pregnancy. It is also important for the proper development of the brain tissues in the fetus. 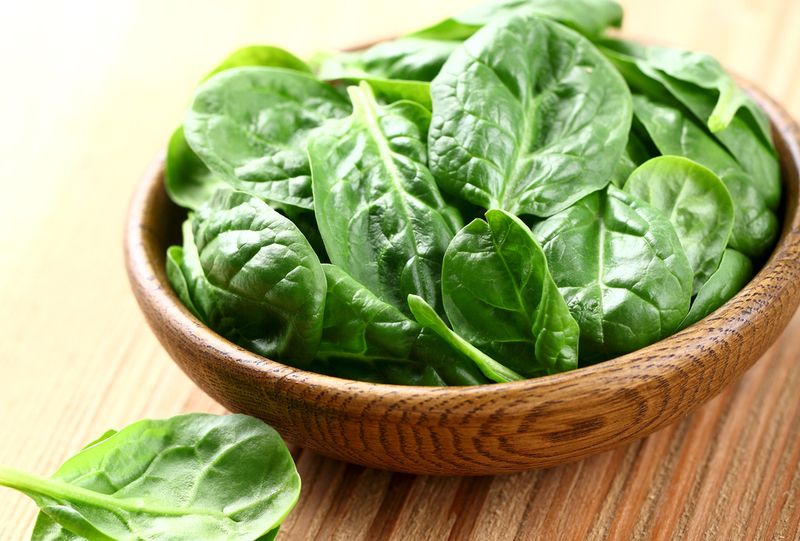 Maintains Blood Pressure: Spinach is loaded with nitrates and potassium. Therefore, eating spinach during pregnancy helps to maintain the blood pressure. The high potassium level in spinach helps to bring down the blood pressure if the sodium level increases. Enhances Development Of Vision And Nervous System of The fetus: Spinach is enriched with vitamins B1 and B2. These vitamins play a key role in the development of vision and nervous system in the fetus. Vitamin B2 is very important for the development of reproductive tissues and inner organs of the fetus. Boosts Immunity: Spinach is loaded with Vitamin C and it helps in fighting the infections. It helps in the prevention of cold and helps in digestions as well. Helps To Prevent Anaemia: Anaemia is a common problem during pregnancy. Vitamin A helps in the formation of red blood cell. Spinach is rich in iron content. Together, spinach is a good choice during pregnancy to bring down the risk of anemia. Helps To Alleviate Pregnancy Pains: During pregnancy, you grow in weight and size. This will take a toll on your bones and muscles. That is why you are prone to aches and pains during pregnancy. Consuming spinach during pregnancy will help to bring down pregnancy pains to some extent. Spinach contains glycolipid, which is an anti-inflammatory agent. These anti-inflammatory components provide relief from aches and pains during pregnancy. Helps to bring down blood pressure- Spinach has nitrates that help in regulating the blood pressure levels. What Are The Side Effects Of Eating Spinach During Pregnancy? In moderation, spinach is safe to consume during pregnancy. However, overconsumption of spinach can bring about several annoying side effects during pregnancy. Interfere With Body’s Ability To Absorb Minerals: Spinach is enriched with oxalic acid. This can bind zinc, calcium, and magnesium and hinder the absorption process of these minerals. Therefore, excess consumption of spinach during pregnancy can lead to mineral deficiencies which affect the normal progression of pregnancy and the healthy development of the baby. Can Cause Stomach Disorders: Spinach is loaded with fiber and helps with constipation. True. However, overconsumption of spinach during pregnancy can bring about bloating, abdominal cramps and even constipation. Can Cause Diarrhoea- Excess of fiber-based foods can create digestive troubles that can lead to loose stools or recurrent bowel movements. Diarrhea during pregnancy is not as good as it can bring about uterine contractions. Can Leads To The Formation Of Kidney Stones: spinach is loaded with purines. If it gets into our body in excess level, it will convert into the uric acid. Too much uric acid set off calcium formation in our kidneys, leading to the formation of kidney stones. Therefore, the overconsumption of spinach leads to the development of kidney stones. Thus, spinach might not be the best choice for the pregnancy-related issues yet it can offer a nourishing boost to the pregnancy diet regime. Since it is high in iron and can cause stomach issues it is best to have it in moderation and always consult the doctor before introducing it. Previous ArticleIs It Safe To Take Suji/ Semolina During Pregnancy? Is It Safe To Take Suji/ Semolina During Pregnancy?